A sample of Giampaolo Maffini's culinary style! Giampaolo is an Italian Master Chef who has worked all over the world. Welcome to Giampaolo Maffini’s Website! 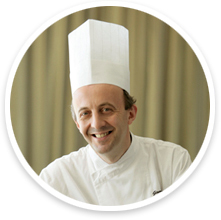 Giampaolo Maffini is a chef from Milan, Italy with many years of experience working in top rated hotels and casinos. His passion for cooking, teaching others and interacting with his guests are well known. For Giampaolo, every guest is important and his goal is to create a memorable meal experience. Giampaolo has led cooking classes, taught in culinary institutions and been featured by numerous media outlets.